DESPERATE PARENTS LED a prayer ceremony outside a flooded cave in northern Thailand where 12 children and their football coach have been trapped for days, as military rescue divers packing food rations resumed their search today. Anxious relatives camped out to perform traditional rituals, making offerings and reciting emotional prayers for their children’s safe return. Some relatives cried at the cave’s entrance near the Laos and Myanmar border, where huge crowds have gathered near stockpiles of water and food. 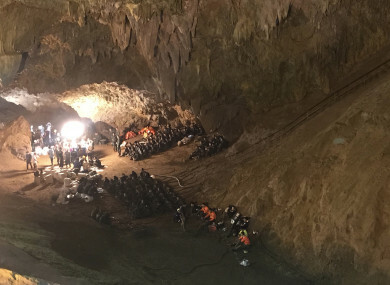 Rescuers found bicycles, football boots and backpacks at the entrance to the site yesterday, and divers said they spotted footprints in one of the cave’s chambers. Navy divers equipped with oxygen tanks and food rations entered the cave early today in northern Chiang Rai province as rain continued to fall. Rescue teams were also dispatched to light the inside of the cave and drain water from the site, and an underwater robot was set to be dispatched to survey the area and help rescuers. “We’re working against time, but we’re not panicking,” he told reporters. Forecasters said rains are expected to continue today, which could hamper rescue efforts. Downpours routinely hit Thailand during the monsoon season from May to October, often causing flooding and landslides. Fifteen people died in flooding in December that submerged large swathes of Thailand’s south and hit hundreds of thousands of households. The fiancé of one of the tourists killed in the accident survived after clinging onto a ledge in the cave for 21 hours. Email “Desperate search continues for 12 children trapped in cave in Thailand ”. Feedback on “Desperate search continues for 12 children trapped in cave in Thailand ”.